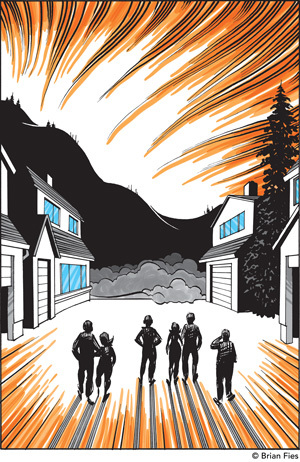 Join Santa Rosa cartoonist Brian Fies to celebrate the release of his graphic novel, A Fire Story, which documents the loss of his home in the 2017 Sonoma County wildfires. In the graphic novel (an expansion of his viral webcomic), Fies shares an honest, unflinching depiction of his personal experiences, including the loss of every possession he and his wife had that didn't fit into the back of their car. A Fire Story is a candid account of the wildfires that left homes destroyed, families broken, and a community determined to rebuild. Cost: Free admission. Donations supporting 2017 North Bay fire relief will be accepted. Free admission. Donations supporting 2017 North Bay fire relief will be accepted.